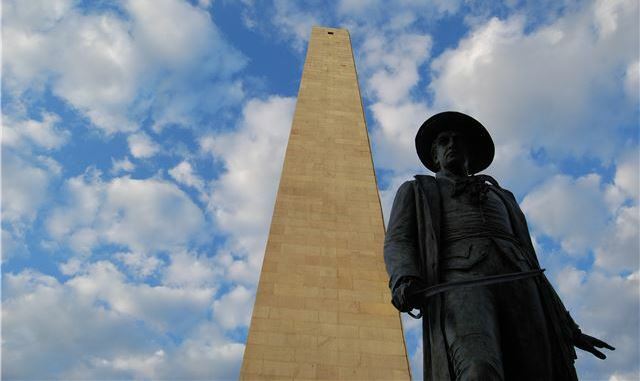 •	Bunker Hill Monument (Monument Square, Charlestown): Standing 221-feet tall and offering unparalleled views of the Boston skyline, the Bunker Hill Monument honors the revolutionary battle that took place on Breeds Hill (we guess Bunker Hill just sounds better for history books!). The granite obelisk was constructed in the 1800s and is the last stop on the Freedom Trail. Climb the 294 steps to the top and — apart from toning your legs — take in the incredible views. •	Monument (251 Main Street, Charlestown): While on the monument theme, head to this trendy, new hotspot by the creators of South Boston’s hugely popular Loco and Lincoln Tavern. Heavy apps and a mammoth cocktail, beer, and wine list make Monument a perfect spot for refueling after the Freedom Trail. Rotating pizzas and other pub fare keep the guests pouring into this expansive space to see and be seen. •	Warren Tavern (2 Pleasant Street, Charlestown): Come for a pint and stick around for the history, as this pub has more of it than most of the typical tourist attractions in town. George Washington and Paul Revere used to pop by back in their day for a beer, and it remains open and popular now with locals and tourists alike. Friendly bartenders and a delicious menu make Warren Tavern a must for your itinerary. •	Brewer’s Fork (7 Moulton Street, Charlestown): Brunch might be the official sport of the South End, but Charlestown now has a serious contender for the best in town with Brewer’s Fork. Duck fat home fries and brunch pizzas can’t be missed for you weekend warriors!